The Worcester Telegram has a writeup on Coach Morris' visit to Worcester for the "Together We are One" tour. It has some quotes by Coach Morris on future FBS opponents. Mentioned are Oklahoma, LSU, Boston College and UConn. If we schedule LSU, I've gotta go. Mrs. Blog will have to start saving. Former UMass HC Don Brown gets a mention in this "Best Assistant Coaches in Football" article. The UMass website has a preview of the Old Dominion Game. This year's visit to Ballard Stadium might be the only time we play the Monarchs. Brandon London and the Montreal Alouettes will be on the NFL Network at 7:00 PM tonight. Set your DVD. The NFL Network is channel 154 on Dish Network. James Ihedigibo was a guest on the Boomer and Craig Morning show. Podcast here. 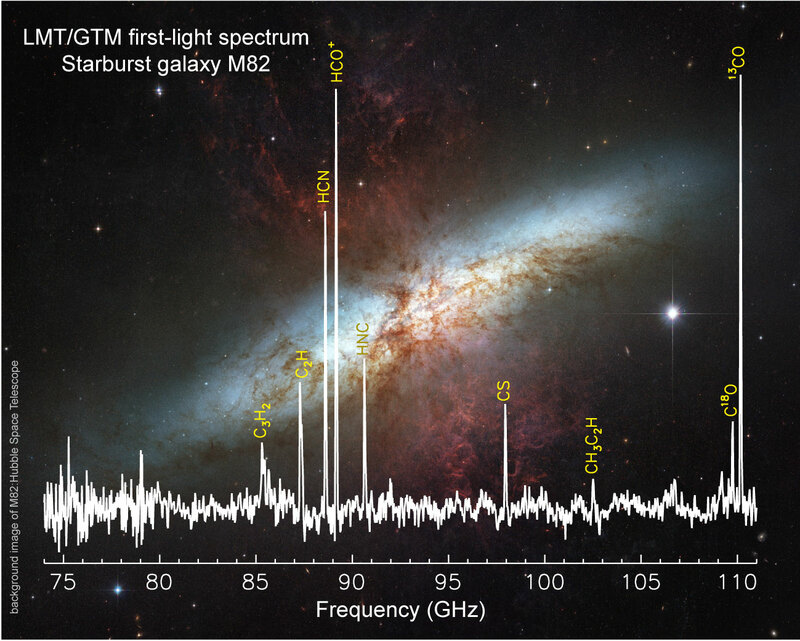 As an amateur astronomer, I'm happy that the UMass astronomy dept has finished their new radio telescope. The scope's webpage here. Click on image for a larger view. 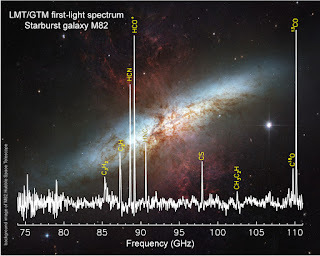 M82 information here. I've visited M82 number of times with my 15-cm refractor. Rivals.com reports UMass has offered to Jackson Matteo, a 6-5 276 pd OL from Ashburn, VA.
Matteo has offers from MAC schools Ball State, Temple and Ohio. 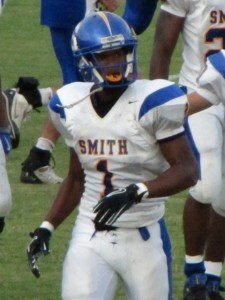 He also has offers from FBS Marshall and FCS schools Bryant and Old Dominion. The UMass website has the "Top Three" plays of 2010. It includes Ryan Carter's 97 yard TD return against Maine. The "Together We are One" video was posted to YouTube yesterday. The team is my favorite moniker, the Stetson Hatters, are gearing up to join FCS football in 2013. Sporting News has a high regard for new CAA team Old Dominion. Coach Morris will be in Worcester this Wednesday to continue the "Together We are One" tour. UMass is #21 in the FCS preseason polls consolidated rankings. The Minutemen are all over the place, with a high of #12 in Athlon and not receiving a single vote on the AGS poll. The CAA website has a feature article on William & Mary's Jonathon Grimes. PPL Park wants to host more off-campus Villanova football games. Remember last week I posted a link on the growing disparity of FBS and FCS finances? Check out the revenue spread between West Virginia and James Madison when the two meet at Fed-Ex Field in Landover, MD. The BC Blog "BC Interruption" looks at recent Eagles-Minutemen history. 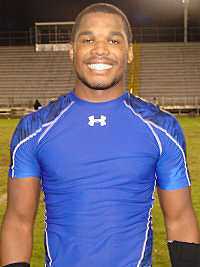 Rivals.com reports UMass has offered to Rhakeem Stallings, a 6-0 210 pd OLB from Chesapeake, VA. Mentioned as a rising senior here. Besides UMass, Stallings holds offers from Western Michigan, Ball State, Florida Atlantic and FCS Old Dominion. The UMass website has some video from the "Together We are One" tour at the UMass club in Boston. Coach Morris says in the video, recruiting for 2012 has gone well. Brandon London has made the Montreal Alouettes roster and should see significant playing time in Thursday's opening game. An alouette is a French word for lark, BTW. "Eagle in Atlanta" has more signs that Boston College's ticket sales are in trouble. 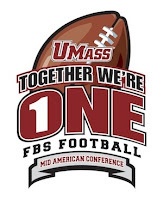 I believe UMass' move to FBS will help football in New England, if Boston College and UConn will play us in a continuing series. Syracuse's attendance at the Carrier Dome has not been robust either. The Orange averaged 40,064 at home and ranked #64 in FBS attendance. Boston College averaged 38,369 at the Heights for a #65 ranking. UConn averaged 38,242 at Rentschler Field. There should be a "Northeast Trophy" for the area. Richmond looks at ten years in A10 basketball and thinks that changes in the Big East will come in ten years or less, which is what we've been saying here for years. If things break right, UMass could end up in the Big East in football and also be part of a new basketball league. The UMass website has the revised Coaches roster up. 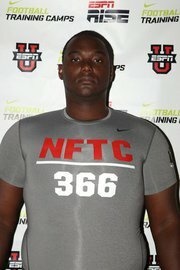 Rivals.com reports UMass has offered to Edens Sineace, a 6-5 300 pd OT from Wellington, FL. Besides UMass, Sineace has offers from Marshall, Middle Tennessee State and Florida International. The CAA Blogger has a long post on news from around the league. Included is the naming of Tyler Holmes to the College Football Performance Awards Pre-Season Linebacker Award. You remember the major sticking point for Villanova's entry into the Big East is their plans to use 18,000 seat soccer stadium PPL Park as their home stadium? Well, the concept will get a tryout this year as the Wildcats will host Delaware at that venue on November 19th. Temple lands a three-star QB with New England roots. I saw the link to this human interest story on AGS message board: A 5-11 205 pd Georgetown DB benched 440 in a powerlifting contest-----and still lost to his dad. Attention UMass Marching Band! We've got to get some of these. Rivals.com reports UMass has offered to Jakarri Thomas, a 6-2 190 pd OLB from Tallahassee, FL. This article says he'll visit UMass. Ran a 11.5 100 meters. Thomas holds offers from Arkansas, Duke, Illinois, Kentucky, Memphis, Pitt, Stamford, UCF and Western Kentucky. UMass has a new Director of Football operations. Jordan Jerry was previously LB coach for Colorado School of Mines. He's a New Hampshire native and holds two degrees from Georgetown. The 2011 season opener at Holy Cross will be televised on CBS Sports. MassLive has a stub article (but a nice image) here. The game is courtesy of the Patriot League's TV package. TSN's Craig Haley has "Ten games that will shape the FCS Season". University of Albany is getting a new stadium. Both Jeff Thomas and Matty V have stories about the three Spring 2011FBS transfers, Kellen Pagel, Ryan Campbell and Chris Burns being ruled eligible for the 2011 season. Thomas also says I missed the starting date for Fall practice by one day. He gives August 4th as the beginning of camp. 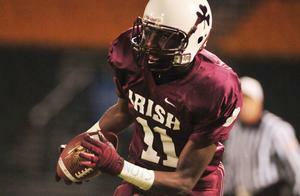 Jeff Thomas also reports on three 2012 recruits UMass has offered. I'll be covering them all in detail later on. The Stamford Times reports Vladimir Ducasse is ready to fight in his second season with the Jets. Special thanks to a good UMass fan for alerting me to FillFittonField.com. They have 8:00 as the start of the UMass-Holy Cross game on Sept 1st. Holy Cross will also be honoring three new members to their Hall-of-Fame at the game. I saw this link over on "Eagle in Atlanta" blog: College football in a Pro market. The Wall Street Journal reports only 17 of the "Major" schools have not had a serious violation of NCAA rules since 1953. Five of the seventeen are MAC schools. From the Article:"It helps if the conference sets a good example. The Mid-American Conference, which produced the most schools (five) of any conference on the list, has its own infractions committee that reviews every violation, no matter how minor, by its member schools. The committee meets in person twice a year, with a representative from each MAC school presenting the institution's infractions for the previous half year. Several conferences, including the Big 12 and Big East, don't do this." MassLive reports Mike Hodges is retiring. The Blog and Mrs Blog join all UMass fans wishing Mike a great retirement. He has been a great advocate for UMass football and the University. 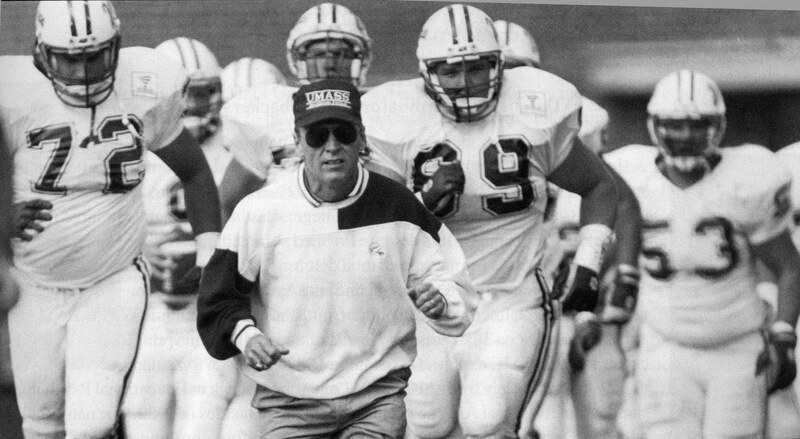 Mike kept UMass football going when Jimmie Reid resigned because of cutbacks in 1991. He never complained, or even mentioned, that fact when those same lack of resources caused some lean years during his tenure as HC. Former UMass assistant coach Malik Hall returns to UMass as defensive line coach. I've blogged a number of times about Hall. Matty V. has an article on UMass' efforts to line up some OOC games for Gillette. Right now, Colorado and Indiana are the teams in the mix. UMass AD John McCutcheon is also in talks with SEC, Big Ten and Big Twelve schools. The BC Blog "BC Interruption" calls for a little mascot-on-mascot violence. Rivals.com reports UMass has offered to Andrew Everett, a 6-4 195 pd WR/DE from Suwanee, GA.
Everett's special teams play gets a mention here. Under Armour combine page here. Besides UMass, Everett holds offers from Southern Mississippi and FCS schools Gardner-Webb and Georgia Southern. More on the CAA's proposal to allow five years of eligibility for FCS football players. More on the widening gap between FCS and FBS revenues. TSN's Craig Haley has a Q & A session with Texas Southern's Kevin Ramsey. Texas Southern was clobbered with NCAA sanctions this spring. This year's MAC Football TV schedule. Rivals.com reports UMass is recruiting Sequan Gooding, a 6-2 190 pd WR from Chesapeake, VA.
Gooding holds an offer from Western Michigan. Drawing interest from Ball State, Delaware, JMU, Liberty, Marshall, Maryland, Old Dominion, Temple and Virginia Tech. The Boston Globe talks about Boston College's move to the ACC. Of interest to UMass fans is an apparent annual series with the Eagles now that we are FBS. With the University of Massachusetts moving to the FBS level, DeFilippo has offered it two-for-one deals over a six-year period, meaning the Eagles would host UMass four times and play twice on the road (which would be at Gillette Stadium). “We’ve offered UMass what we’ve given every MAC school — a two-for-one deal. I think it’s fair,’’ he said. UMass-BC is not Florida State-Miami or even South Carolina-Clemson, but it would be a start, especially since DeFilippo steadfastly refuses to put Connecticut back into the loop. In basketball, BC will play UMass, Providence, Holy Cross, and Harvard on a regular basis in nonconference competition." A Bleacher Report article that looks at potential FCS-FBS upsets in 2011 (UMass -BC is not one of them). The MAC currently has 85 alumni in the NFL. 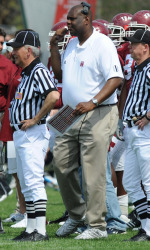 The UMass website has the next issue of their 2011 season preview with details of the game with Boston College. I saw the following link over on BC Blog "Eagle in Atlanta". When we play the Eagles this year, they won't have Matt Ryan like they did in 2007. Keepers College Football ratings has his Spring FCS Football Stats page up. It's a must for statistics nuts. Jeff Thomas of MassLive.com has a short article on college football income and expenses that adds a link to the 108-page NCAA report I commented on yesterday. Former UMass student Taurus Londono has an article for Yahoo Sports that discusses the complicated relationship between Massachusetts and Connecticut and their various sports teams including UMass and UConn. Delaware OnLine has a story about the CAA's intention to push for five years of eligibility for football. Apparently that means just what it says, football players would be able to actually play for five years. Two MAC athletic directors were named Under Armour regional Athletic Directors-of-the-year. Temple was named for the Northeast and Western Michigan for the Central. Temple's continuing upgrade of their athletic facilities is impressive. "In CAA Football, it was decided that the University of Massachusetts, which is in the process of transitioning to the FBS level, will not be eligible for the CAA Championship in 2011, but its players will still be eligible to receive pre-season, weekly and post-season awards. The Minutemen’s official conference record will be recorded as 0-0 and it will not occupy a spot in the CAA Football standings. However, the game results will be reflected in their opponents’ conference record. CAA Football will have 11 members this season with the addition of Old Dominion University. Georgia State University will join CAA Football in 2012". They will also sponsor NCAA legislation allowing five seasons of eligibility for football. Not sure what they mean by that. Be able to use four years of playing in any five year time period without a medical redshirt? Former UMass assistant coach Bob Shoop is now the defensive coordinator at Vanderbilt. Shoop's Vandy bio here. "Last Week's Relegation: UMass -- So the Minutemen's stint on the BC Interruption Hate Index was quite short-lived. Unfortunately, a pro-UMass crowd got hold of the Hate Index last week and with a late voting surge, ran away with last week's relegation poll. No matter. I suppose it's just as well that we don't waste any more words on the Minutemen, seeing as they pale in comparison to BC in football, hockey, basketball, sailing, baseball and pretty much every other collegiate sport out there. " The Maryland blog "Terrapin Station" has a profile of Coach Dudzinski. Bleacher Report has one of those lets-rearrange-all-the-conferences stories and places UMass in a hypothetical "Northeast Conference" . UMass athletics has a page in which you can vote for the "Play-of-the-Year". Two UMass football plays: Antoine Tharpe's big hit against JUM and Ryan Carter's 97 yard return against Maine. Brandon London caught six passes for 67 yards and a TD in an Alouttes' preseason game. Image from London's modeling career during his time with the Dolphins. Rivals.com reports UMass is recruiting Corey Taylor, a 5-11, 175 pd DB from Virginia Beach, VA.
Taylor holds offers from Ball State, Elon and Western Michigan. 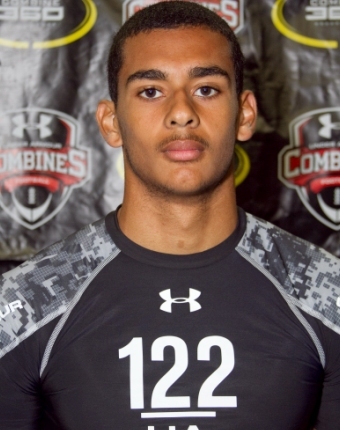 He is also drawing interest from Army, Navy, Appalachian State and Marshall. Jeff Thomas of MassLive notices, as we have seen here, UMass is offering to FBS-level recruits. The CAA blogger has a summer feature on Delaware's Andrew Pierce. Keron Williams and Anton McKenzie are on the roster of the B.C. Lions. Craig Haley of TSN has a story about FCS promotions in his "In the FCS Huddle" column. No FCS team in the nation reported a positive cash flow according to the NCAA. Andy Talley's bone marrow registration drives have made an impact on the number of donors. Charlotte 49ers move to FCS football may have some ramifications for the Atlantic 10. 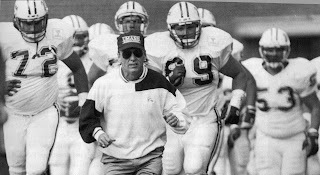 Former UMass assistant coach Ted Roof is making $500,000/yr as defensive coordinator for Auburn. 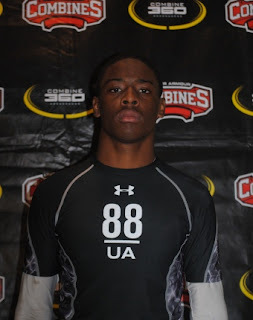 Rivals.com reports UMass has offered to Jahmal Pardner, a 6-1 179 pd CB from Rochester, NY. Pardner's Rivals page is here. Pardner's HS won the NY Class A football championship. Besides UMass, Pardner holds offers from MAC schools Akron, Bowling Green, Buffalo and Temple. FCS Albany has also offered. 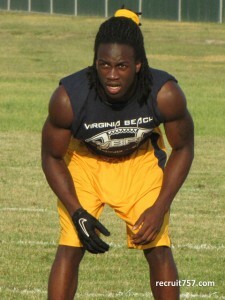 Rivals.com reports UMass has offered to Kadeem Thomas, a 6-0 230 pd ILB from Tallahassee, FL. Elite Scouting Services video here. Tallahassee QB Club Defensive Player-of-the-Year. Besides UMass, Thomas holds offers from Cincinnati, Florida A&M, Georgia Tech, Illinois, Kentucky, Louisville, NC State and Tennessee. Rivals.com reports UMass has offered to Ryan Morris, a 6-6 241 pd TE from Barnegat, NJ. He's an ESPN three star player. This Syracuse blog post features him. Besides UMass, Morris has offers from Buffalo, Cincinnati, Duke, Illinois, Indiana, Louisville, Marshall, Purdue, South Carolina, Syracuse, Tulane and UCF. Victor Cruz will help Marcel Shipp in his 4th annual football camp. Stamford Today has an article about Vladimir Ducasse and his classmate Alex Joseph. Possibly more change comes to New England athletics-----what happens if UConn adds lacrosse? Matty V. reports on a TampaBay.com article saying UMass has offered to Jacob Guy, a 6-5 191 pd QB from St. Pete. Guy's ESPN recruiting page is here. Guy is ranked by ESPN as a three-star recruit. 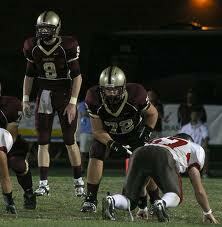 Guy was also All-North Suncoast Offensive Player-of-the-year. This article features him. Another article here. Guy also has an offer from Western Michigan. The UMass website has the second preview from the 2011 season as they cover the Rhode Island game September 17th. Craig Haley's "In the FCS Huddle" column looks at defending National Champion Eastern Washington. The WAC will vote on expansion Tuesday. This article mentions six FCS schools as possible members. Montana would easily fit the WAC profile. Matty V. reports UMass has signed Rodney Mills, 6-2 210 pd LB/S from Gainesville, FL. 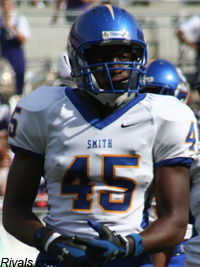 This article features Mills signing with UMass. Another article about his signing with the Minutemen here. Mills' Under Armour combine page here. 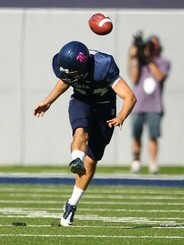 Matty V. reports UMass has added Brandon Yelovich a transfer kicker from Rice. I received an E-mail from Jason Cherry. He's going to hang up his cleats as kicker in professional indoor football. Jason played seven seasons for six different teams, including the Arizona Rattlers and the Columbus Destroyers. He ended up with 430 points and 32 tackles (a statistic, he says, kickers are not enthusiastic about). His totals included the first successful extra point drop kick in the AIFA league. He and his wife welcomed Margaret Penrose Cherry (UMass class of 2023) into their life on April 19th, 2011. He says he's still a UMass fan and hopes to go to some of the MAC games when UMass plays Akron or Toledo. Eagles Blog "BC Interruption" adds UMass to his hate index. UMaine is concerned about future conference affiliation. The Charolette 49ers might end up in the CAA now that the Big South and the Southern Conference have turned down Charolette's bid to join those two leagues. Austin Lane, a 6-6 304 pd OL lineman for Syracuse picked the Orange over the Minutemen. 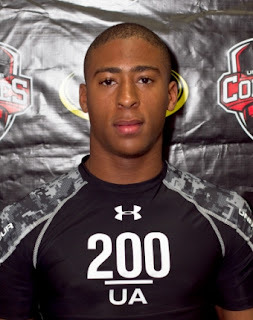 Rivals.com reports UMass has offered to Tashon Whitehurst, a 6-3 187 pd OLB from Gainsville, Fl. Whitehurst has offers from Marshall, North Carolina State, Syracuse and Western Michigan. MassLive's Jeff Thomas has a story with links to article that mention Jeromy Miles (Bengals Bio) and Sean Smalls (Argos Bio). Smalls gets another mention here. 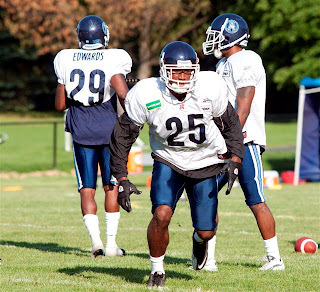 The UMass website has a story about Brandon London (Alouettes Bio) in the Montreal Alouettes Camp. HC Kevin Morris' "Together we are One" tour adds another stop in Worcester on June 29th. Info here. Click on the image for a larger view. 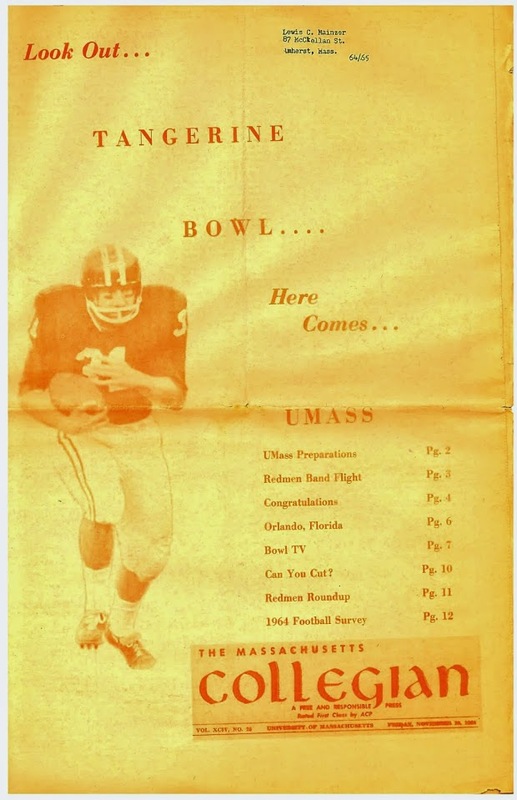 I've added 14 scans to my UMass historical scans folder in Picassa. The album is here. Scroll to the new 1988 images. The inconspicuous magnifying glass image allows a zoom-in feature to make reading print easier. In 1988 UMass went 8-4 overall and 6-2 in the Yankee Conference to finish as conference champions. UMass lost to Eastern Kentucky 17-28 in the first round of the FCS playoffs in a driving rain that hampered UMass' passing attack. Notable game was UMass' 64-42 shootout win at UNH to finish the season on November 19th. I was there and I distinctly remember at the end of the game it was so dark that the field was lit by the glow of the Wildcats scoreboard showing the 64-42 total. The UMass players were jumping up and down and pumping their fists in gathering twilight. John McKeon (set UMass single season TT record with 49-128 177 TT. Chip Mitchell was leading receiver with 33-638 19.4 AVE.
Kevin Smellie was leading rusher 188-807 8 TD's. 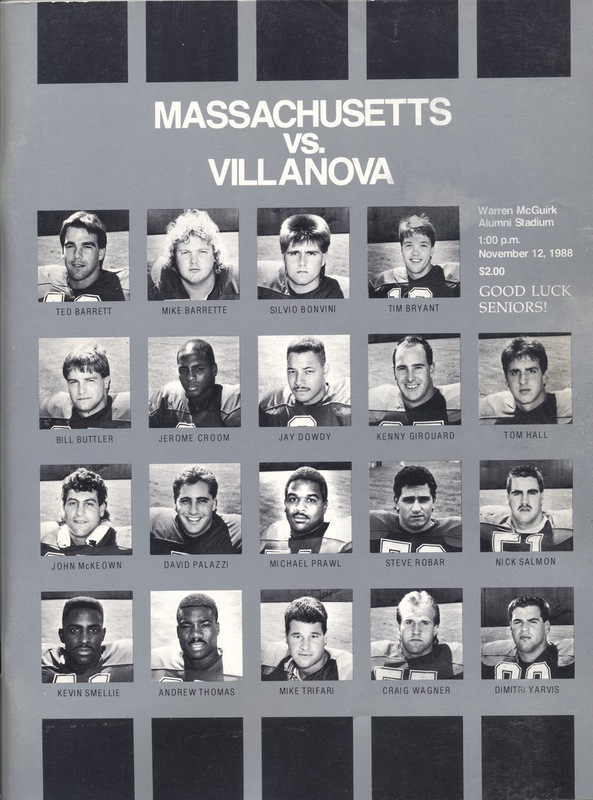 Other notables from that team were Gary Wilkos (who went on to have perhaps the best freshman UMass QB season ever), Thorr Bjorn, Paul Mayberry, Ron Villone and Joe Cullen. A number of players from that squad continue to support UMass football in Friends of Football. MassLive.com discusses the impact of Chancellor Holub's possible non-renewal might have on UMass' move to FBS. Business West says the turnover will hurt UMass. I have to shake my head about how some people are determined to keep UMass-Amherst as a larger version of Fitchburg State. There's a reason why Penn State, Michigan and schools like UCLA are national research and educational centers. The reason might be called "vision". If advocates of torpedoing FBS football get their way, it's an open statement mediocrity instead of achievement is goal at UMass. The "vision thing"----- it's in short supply in some circles at UMass. This is a cool feature: the UMass website has a preview of the Holy Cross game on Sept 1st. FCS team Central Arkansas joins the slate of teams with unusual football fields now that they have purple and gray field turf. On Saturday, I did a blog post on Matty V's article on Todd Bankhead. Matty has a post on how he is looking for suggestions about future articles. E-mail him if you know a good candidate. Brandon London may be catching passes from Rickey Santos at the Montreal Alouettes. The CAA is having itsAnnual meeting June 4th through today. They're also on Facebook and Twitter. Nate Montana was arrested for DWI at Montana. He already had one alcohol related incident when he was at Notre Dame. Like UMass, New Hampshire will have a new QB in 2011. 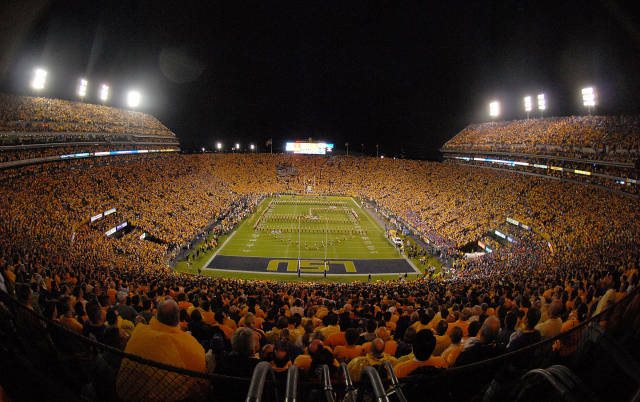 The SEC Presidents voted 12-0 to reduce the number of players signed annually to 25. The SEC's 12 coaches had voted 12-0 against the proposal. The league also voted to crack down on medical roster abuses. 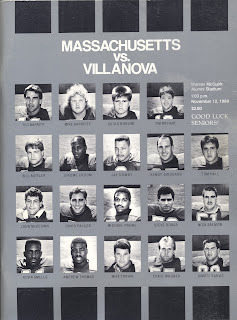 I hope to have an article on UMass football history including scans of some 1988 game programs ready by tomorrow. The Ledger-Enquirer.com says UMass has offered to Cequanti Ford, 5-8 180 pd RB/DB from Carver HS in Columbus, GA.
Ford is from the same HS as 2011 UMass recruit Jarvis Bentley. Drawing interest from Alabama, Auburn, Clemson and Georgia. MassLive has a short notice on Andrew Dees joining UMass football here. Syracuse.com also has a short blurb here. The UMass site has a reprint of Taurus Londoro's article for Rivals about Tyler Holmes. Matty V. has an interview with Todd Bankhead. Nice to see that he's doing well. Bankhead's is still #2 all time in career passing yards. In 1998 and 1999 he went 561/1303 7,018 yards and 51 TD's. And, of course, Bankhead owns the only QB National Championship ring. The BC Blog "BC Interruption" has a post on interesting FCS Vs FBS games including this year's Eagles-Minutemen clash. Dave Coulson says Jim Tressel's troubles go back to when he was a coach at Youngstown State. UMass has added Andrew Dees as running back coach and recruiting coordinator. The UMass website has a poll by Athlon Sports ranking UMass #12 preseason. The BC Blog "BC Interruption" speculates about Doug Flutie as an assistant college coach and mentions UMass. TSN's Craig Haley's column "in the FCS Huddle" has a story about advice from former FCS star Jerry Rice. Have the BCS schools finally figured out a way to dump the rest of college football?. If they're going that way, why not form a semi-pro league and get rid of all those tiresome classes and other distractions. 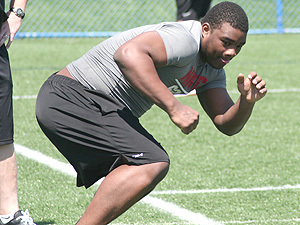 Scout.com reports UMass has offered to Treyvon Hester, a 6-3 275 pd OG/DL from Penn Hills HS in Pittsburg. 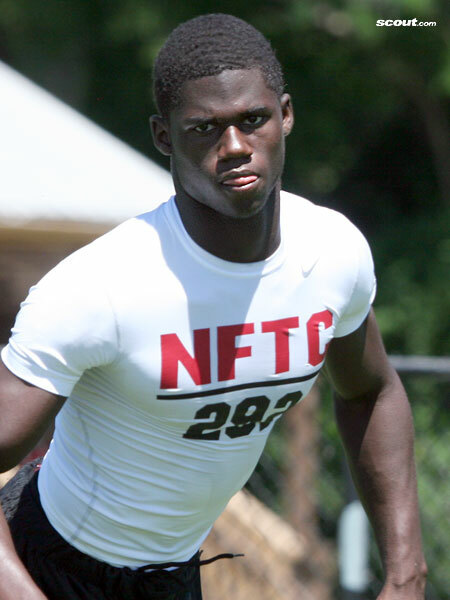 Hester was named MVP of the recent Nike State College camp. Hester has offers from MAC schools Kent State, Temple and Toledo. Interest from Pitt and Cincinnati. First, Mrs Blog and I wish to express our sympathy to the people of Springfield that were hit with the tornado yesterday. Both of us worked in Springfield at one point in our lives and had many friends there. Jeff Thomas has a short story about Tyler Holmes being named to the Sporting News All-America team. Vladimir Ducasse (Jets bio) get several mentions here and here about the NFL lockout and the Jets bringing back Damion Woody. The Pats organized a large scale workout at Boston College yesterday. UMass is not showing up in preseason FCS Top 25 lists for 2011. At first I thought it was because we are not eligible for the playoff this year. However, Tyler Holmes is usually noted as a first team All-FCS player, so it seems UMass is just not getting any respect. Josh Buchanan shows Lindy's Top 25 and Sporting News Top 25. The AGS Top 25 poll is here. The UMass website has a story about Julian Talley and Jonathan Hernandez being named to the CFPA watch list for the top players of 2011. 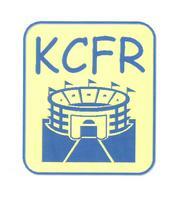 Note that I cannot find the notices on the CFPA website, so the news may be coming from press releases. TSN's Craig Haley gives UMass-Boston College as one of his FCS-FBS matches that stand out in 2011. Jim Tressel resigned because some of his players received a discount from a local tattoo joint (gasp! ), but the SEC is still thinking about banning oversigning. Carjacking suspect claims he's from the 5th dimension.